Kate has been teaching yoga and meditation and cultivating community since 2002. She endeavors in each class to create safe, inclusive space for self nurturing and unfolding. Her core values are empathy, integrity, equity and respect. Kate offers accessible variations and encourages nonjudgmental awareness. Her classes have been called welcoming, friendly, creative, intuitive, and fun. She lives in Brooklyn, NY. Come and experience life on the farm, in the field, on the mat, and around the table. 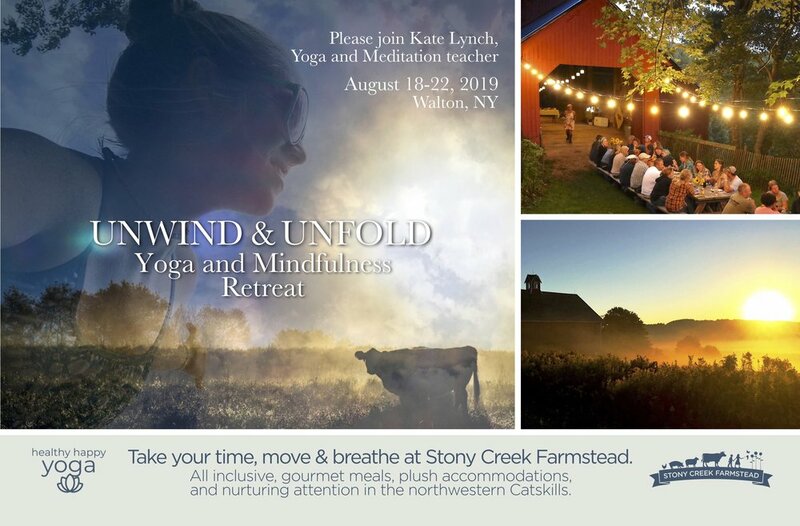 This judgement-free yoga, mindfulness and meditation all inclusive vacation will be a small, cozy retreat. Practice mindful, flowing sequences and breath patterns before breakfast. Before dinner, unwind with luxurious restorative yoga and meditation. Receive guided relaxation for complete surrender. Enjoy delicious, nourishing, farm-to-table meals; conversation and community. Hike the hills for breathtaking views. Swim in the crystal clear pond. Join farm and craft activities, or simply appreciate silence in nature. Unwind as your breathing practice and sleep are infused with fresh mountain air.